In the small, ramshackle house of the Abu Awwad family in the Shati refugee camp, the furniture has been shuffled and dismantled. The three bedrooms have been emptied of bed frames, sofas and tables, replaced by heaps of mattresses on the floors. The home where nine people once lived, now shelters twenty. Whenever Hamas fires a rocket, three generations of Abu Awwads huddle in nervous anticipation of an Israeli response. The influx into the Abu Awwad household came as family members fled the Israeli bombardment and shelling in other, more dangerous parts of Gaza. There is one question in the back of everyone’s mind: Is it happening again? In December 2008, Israel launched Operation Cast Lead, a three-week assault of Gaza in response to Hamas rocket fire. Israel targeted police stations, weapons caches, political offices and militants. In January 2009, ground troops moved in. Throughout the conflict, 1500 people were killed, mostly civilians. Now, as diplomats in Cairo continue to push for a ceasefire of hostilities between Hamas and Israel, the ordinary citizens of the besieged enclave worry about the future—including the threatened Israeli ground invasion. In the past week of fighting, at least 110 Palestinians (the death toll continued to mount throughout the evening) and three Israelis have been killed. The booms of shelling and thunder of airstrikes throughout the day and night has cast an eerie sense of déjà vu across the enclave. The buzzing of drones is so loud at times it feels they have penetrated your skull. Now, the middle-aged English teacher spends the nights laying awake and worrying about the family’s future. It’s like the feeling she had four years ago—she doesn’t know where the next strike will hit and she’s not sure if she’ll see the morning. Sabha, Tayeb’s grandmother, has also moved into the house from Twam. The airstrikes in the first days of fighting outside the elderly woman’s home shattered her windows and broke the doors. Sitting on the floor of the family sitting room, her eyes a cool liquid blue from cataracts, she says she’s not going back until everything calms down, but can’t really make any guesses on when that might be. It’s a sentiment I hear elsewhere in Gaza City: Israeli strikes pushing Palestinians back into the arms of a group whose based was thought to be shrinking. Though Hamas enjoyed a brief period of popularity after they won elections, alleged corruption, high taxes, strong-armed rule and strict interpretation of Islam cost them supporters. In Gaza, even those who vehemently support Fatah, Hamas’ more moderate rival that controls the West Bank, have jumped to defend Hamas’s handling of the current conflict. 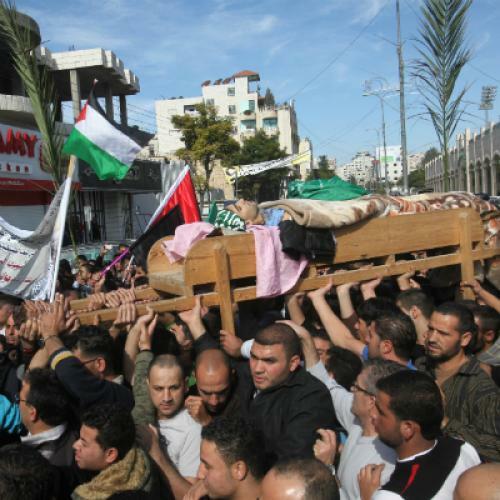 On Friday in Ramallah, at a protest and show of support for Gaza, Hamas supporters overwhelmed Fatah participants. The Abu Awwad family, like others in Gaza, has become adroit at identifying the sound of incoming attacks—F16s, bombs, shells—as well as those of outgoing rockets. This is not the first time they’ve heard them, and it’s not the first time they’ve huddled together to brace for possible impact. Tayeb’s sister, Sajada remembers the last war well. That time the family stayed with friends in a different part of Gaza City. “The last was more dangerous, because of the ground invasion, but both are scary,” the 14-year-old says matter-of-factly. She tells me the Abu Awwads were the last family to evacuate Twam. “My friends all left earlier than me,” she says. “In both wars!” Tayeb chimes in. The plump adolescent, still growing into her frame, smiles at her brother. But at night, fitful sleep tell a different story. The drones buzz overhead and the echoes of shelling ripple off the waterfront. As diplomats and politicians work in Cairo for a ceasefire, shelling on the beachfront has intensified in the evening darkness. The extended Abu Awwad family waits in the house, together, to see the results.